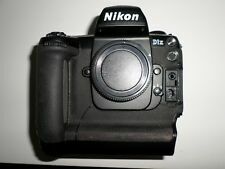 Showing results for "nikon d1"
So convenient! NIkon Spot On Wind Meter plugs right into your smartphone to provide instant data on wind speed, direction and adjustments. Simply download the free Nikon Spot On Ballistic Match Technology App, plug the Spot On Wind Meter into your phone and customize to your model of riflescope, caliber/load, sight-in distance and target distance. The app will display needed adjustments on your phone screen! Captures current wind speed and direction relative to your target Use Spot On Ballistic app to see hold-over points for bullet drop and number of clicks needed to adjust for wind drift App displays wind drift on your reticle in either clicks, inches or MOA Compatible with Android and iOS Simple and incredibly handy! Order yours today! Gender: Unisex. Nikon O/C ASSEMBLY This is a NEW original old stock Nikon part. It will fit Nikon MD-1 or MD-2 motor drives to open latch for F2 backs. It's in pristine condition. Thanks For Looking!